Clear, with a low around 44. Windy, with an east wind 26 to 29 mph, with gusts as high as 41 mph. Sunny, with a high near 58. 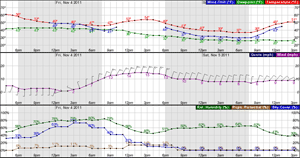 Windy, with an east southeast wind 23 to 29 mph, with gusts as high as 41 mph. Clear, with a low around 45. Windy, with an east wind 23 to 25 mph, with gusts as high as 36 mph. Sunny, with a high near 58. Windy, with an east southeast wind 23 to 26 mph, with gusts as high as 37 mph. Mostly clear, with a low around 45. Windy, with an east wind 20 to 23 mph, with gusts as high as 33 mph. Sunny, with a high near 58. Breezy, with an east northeast wind 17 to 20 mph, with gusts as high as 28 mph. Mostly clear, with a low around 45. Breezy, with an east northeast wind 17 to 20 mph, with gusts as high as 26 mph. Sunny, with a high near 58. Breezy, with an east wind around 21 mph, with gusts as high as 29 mph. Mostly clear, with a low around 45. Breezy, with an east wind around 21 mph, with gusts as high as 29 mph. Sunny, with a high near 57. Breezy, with an east southeast wind 13 to 21 mph, with gusts as high as 29 mph. Mostly clear, with a low around 44. East wind around 14 mph, with gusts as high as 18 mph. Sunny, with a high near 57. Northeast wind 6 to 14 mph, with gusts as high as 18 mph. Mostly clear, with a low around 41. East wind around 6 mph. Sunny, with a high near 53. East wind around 7 mph, with gusts as high as 22 mph.